The word, Moira, is a Greek word for fate. I believe in more than fate but I am somehow taken with this word I’ve just learned. The things written deep inside of me do feel as if they are a fate I am drawn to, like a moth to a flame. This fall I accomplished a personal goal for my 40th year. It was to climb Middle Sister. It is a steep hunk of rock that looks just like a mountain should. It’s the type of mountain you draw as a child, an upside down V. Its sisters, North and South, hug it on each side. Now I have wanted to climb Middle Sister for several years. The opportunity came on a glorious, warm, sunny day in October. It was like a kiss from God. It was a challenge to get someone to go with me because my husband did not want me to tackle this venture alone. My friends all seemed to be busy. Except for one, Shanda, and she said, “Yes.” So the two of us set out for a long day of hiking and climbing. It was going to be a tiring day but I was game. I was more than game. I was giddily thrilled. We met up at 7am and headed to the trailhead. We shed our down coats 15 minutes into the hike. The day was absolutely faultless. I felt like God made it just for us. The forest had been recently burned and the views the burn afforded were enticing. I was energized and joyful. The air smelled crisp like fall, the sun warm like summer, and the view made me crave the climb. A group of college girls hiking together offered us chocolate chip cookies. Love flung all over the place. We got to Camp Lake and it is one of those places that cause me to catch my breath in its perfection. The South and Middle Sister frame it on each side. The water is that alpine, glacier, sky-reflective blue that makes me want to dive in. We stopped, ate trail-fare, and filled up our water bottles. Granola bars and jerky never tasted so good. After an hour I consulted my guidebook page to begin our decent. It didn’t give us the best directions. We followed a trail that appeared to head to our South ridge destination. We passed a hiker and asked him if we were on the correct trail. He said “Yes, you just need to pass some snow melt and you will find the South Ridge climber’s trail.” So we kept on until we got a gut check that said let’s go back. Consequently we went back and one point scared me badly. We came to a place that I needed to literally jump over and grab a solid red rock. If I did not reach it, I would slip and the incline would send me down the mountain to injure myself. I love mild risk, but I do not love getting hurt. So I breathed a prayer and jumped and I am here to tell about it. I was jittery the rest of the climb. We almost gave up as we were near the summit because the reveal was so much that we both second-guessed our safety. And I did. I looked around the corner and found us a safer way to climb over the little ridge to the summit. I peaked my head back to Shanda and said, “Come on. We can do this.” And we did. And it was gritty and majestic. 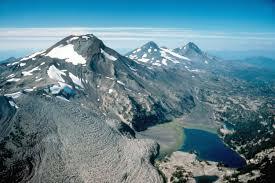 The summit affords up close views to the most beautiful side of South Sister. I felt on top of the world! Our college cookie-girls showed up a bit behind us and we got to congratulate them. My favorite moment was watching them pop a beer open and say “cheers” in celebration of the summit. I’m going to adopt their tradition. We took pictures of them and they of us and it was an eternal moment. It makes me think of when we see Jesus for the first time, and when we experience the indescribable splendor of Heaven. I can imagine we will pop open a beer and say “Cheers” in celebration of the enduring we did, the fear we lived through, and the joy we have at being home with Love. The beauty will take our breath away, our camaraderie will finally be full and the tingly joy will find us unafraid to be overwhelmed with the Presence we have longed for. I climb mountains to scare and to thrill my heart to life. My soul gapes wide in the longing for Jesus. I will climb mountains seeking to stay fully alive until I can reach my hands and place them on the side of His face. Jesus, He is my Moira. Jill Dyer is a writer who lives and plays in Central Oregon with her lion-hearted husband and four loved children. Your hunger for Jesus is rare and beautiful. Shan. Only one who hungers can recognize the hunger. Thank you, Jill for your entry. I could feel your challenge and excitement as you started this climb. I was with you the whole way. Blessings to you! Thank you, Mary. I don’t think there is a better comment than to know you were with me the whole way.